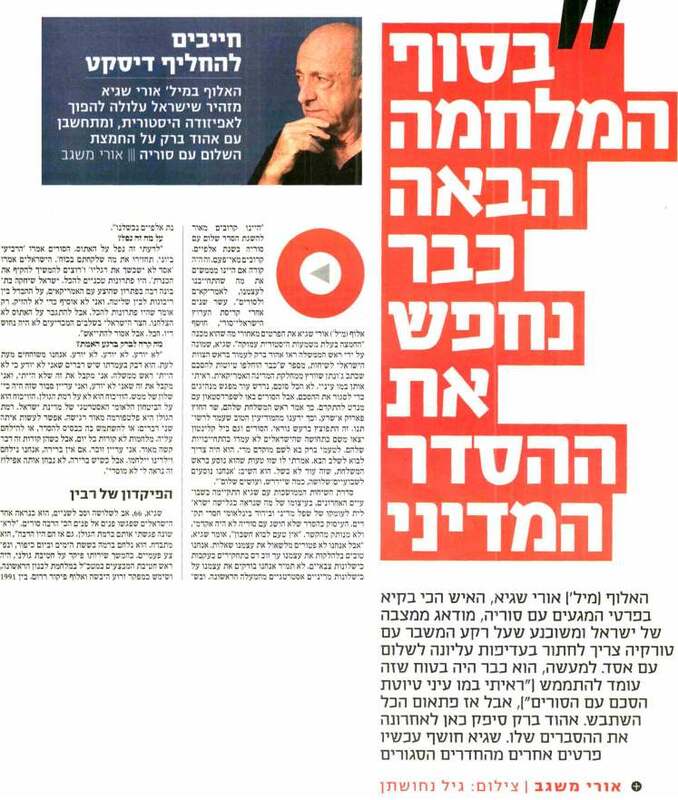 Maariv summarizes a news item from the Lebanese A-Safir. It’s unclear, however, whether the section on Mitchell visit is also from that source. The byline is unusual. Bardenstein is the junior diplomatic affairs correspondent and probably does not speak Arabic. Items based on direct monitoring of the Arab press are usually bylined by the Arab or Palestinian affairs correspondents. Bardenstein’s sources are almost exclusively in the Ministry of Foreign Affairs and the Prime Minister’s Office. Along with the direct talks between Israel and the Palestinians, France and the US are acting to put in motion the political negotiations between Israel and Syria. Over the course of the holiday and yesterday, two top officials visited Israel who are responsible for talks on this channel. They met with top Israeli officials and in the next few days will go to Damascus for meetings with Syrian President Bashar Assad and with Syrian Foreign Minister Walid Muallem. The Lebanese As-Safir newspaper wrote that the French official was Jean Claude Cousseran, French President Nicolas Sarkozy’s special envoy to the Israeli-Syrian talks, and Fred Hoff, deputy to special US envoy to the Middle East George Mitchell, who is responsible for the Syrian-Lebanese desk for Washington. Cousseran and Hoff met with Defense Ministry officials, including Defense Minister Barak. The paper further reported that in his visit to Damascus, Cousseran will try to clarify to what extent Syria will agree to be flexible in its demands of Israel even though, at every opportunity, Assad is firm about stressing that without a withdrawal from the Golan Heights, there will be no peace. Cousseran will also try to help get the dialogue moving on this track by means of putting pressure on the Israeli side to enter into the negotiations. France believes that if this works, the US will take on itself the role of patron of the talks. Envoy Mitchell is also expected to visit Damascus and will try to get the support of President Assad for the direct talks between Israel and the Palestinians and to relay a message in the matter of the importance that the US attributes to talks on the Israel-Syria track. What did it collapse over? What happened to Barak at the moment of truth? Saguy, 66, a father of three and grandfather of two, is probably one of the Israelis who has met the most Syrians face-to-face. “I first met them on the Golan Heights. There were a lot of them then, too,” he quips. He fought on the Golan Heights in the Six-Day War and the Yom Kippur War and was wounded twice. Later in his service he commanded the Golani brigade, was head of the general staff’s operations department in the First Lebanon War and served as commander of the land forces and the Southern Command. Between 1991 and 1995 he served in his most important position, chief of intelligence. Only there, he admits, did the coin drop. “I spent many years as a military man on the Golan Heights, I saw it burn, not only thrive,” he explains. “I did not understand what only later as chief of intelligence I was able to understand. It was a job that helped me develop a much broader worldview. I understood additional factors, I understood the limits of power.